With the cool weather and the holidays coming just around the corner today #SundaySupper has teamed up with Certified Angus Beef® brand to share with easy slow cooked recipes to have at your holiday table. 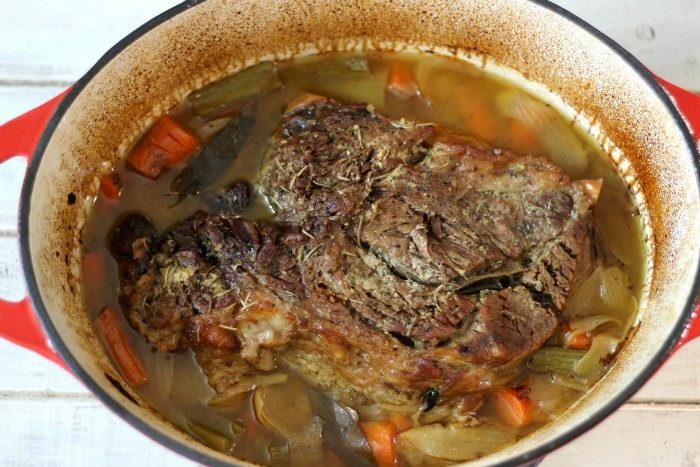 My recipe for today is one I can’t believe that I have never made, it is Beef Pot Roast. I picked this recipe because I remember as a child always going to my Grandmas house having Beef Pot Roast for Sunday dinner. It was one of my Stepdads’s favorites. This recipe truly feels like home to me. The Pot Roast turned out amazing. It really does taste just like Grandmas. The meat is so tender that is just falls apart. When I took it out of the pot I started losing pieces of the meat. So I took it out of the Dutch Oven and placed it on my cutting board; trimmed the fat and shredded it. I thought doing it this way makes for a more easy way of taking it off the plate. One of my favorite things about this recipe, besides the beef are the carrots. The carrots are so good cooked in beef broth and perfectly fork tender. I kind of wish I added more carrots to the recipe. If you like roasted carrots as much as I do, add more to the recipe. This is what the Certified Angus Beef® Chuck Roast looked like when I took it out of the oven. For this recipe I used Certified Angus Beef® brand Chuck Roast Boneless. I happened to be at my local grocery store, Lucky’s, where my butcher was placing Certified Angus Beef® brand on the butcher shelves. I asked him, what kind of beef do you recommend for Beef Pot Roast? I thought it was pretty funny, but he was so excited to help. This is one man who loves his beef. He was the one who recommended Certified Angus Beef® brand Chuck Roast, boneless. He was absolutely right! I choose Certified Angus Beef® brand because of its reputation. The Certified Angus Beef ® brand is the world’s first brand of beef, established in 1978. The Certified Angus Beef ® brand is more selective than USDA Choice and Prime. Each cut must meet 10 exacting standards for quality. It’s beef of unrivaled flavor, juiciness and tenderness, plus it is known for its marbling; the little white flecks of flavor that ensure the tastiest, most tender and juiciest cuts of beef. Yum! That is why my roast is so tender. Now don’t let the fat fool you, it’s a healthy kind of fat and you definitely want marbling in your beef. Some people are intimidated by cooking roasts. I’ll be honest with you, I am one of those people. If you read my blog, you’ll know that I do not cook too many roasts. But my days of cooking beef roast fears are over. I have downloaded a new App on my iPhone called Roast Perfect. This App is amazing! It lets you select a roast, it asks you how many people and then it tells you the size roast you should get. It also tells you what the serving size is. This makes it so much easier when your standing at the butcher counter just staring at you Certified Angus Beef® brand. Here is a tiny breakdown of what the free App can do for you. I’m telling you, you will love it! Recipes: such as Beef Wellington, Boneless Ribeye Roast, and Bourbon Marinated Sirloin Tip Roast just to name a few. Roasting Tips: how to choose your beef, how to tie it, how to roast it and how to carve it. 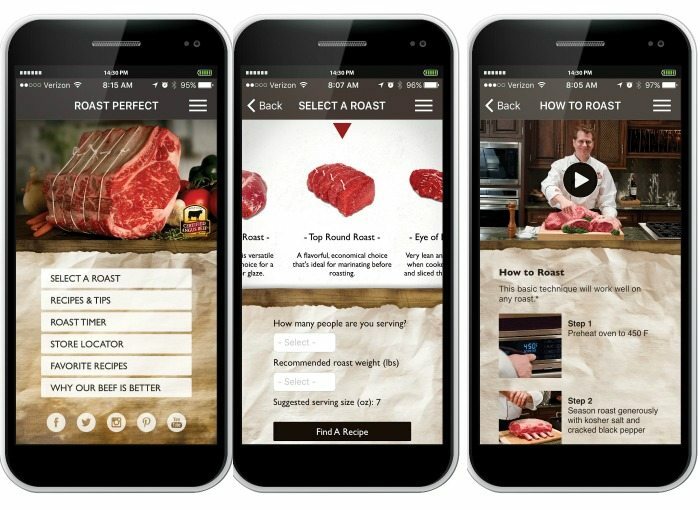 Perfect Roast Timer: This lets you select the roast, size and how you want it cooked. It will set the timer on the app for you so you know what to do each step of cooking your roast. Store Locator: Where to buy your Certified Angus Beef® brand. Why Our Beef is Better: This gives you a little inside scoop on Certified Angus Beef® brand. The Perfect Roast App is so user-friendly, easy to read and is Free in iTunes store (for iPhone and iPad) and Google Play (for Android). I feel like I got off the subject of my Beef Pot Roast. 🙂 I just get so excited when I find new things that I just love. Anyway, I wanted to let you know that my Beef Pot Roast is super-duper simple to make. All I did was sear my meat on all sides. Added my vegetables, beef broth and seasoning and let it cook it in the oven for 4 hours. 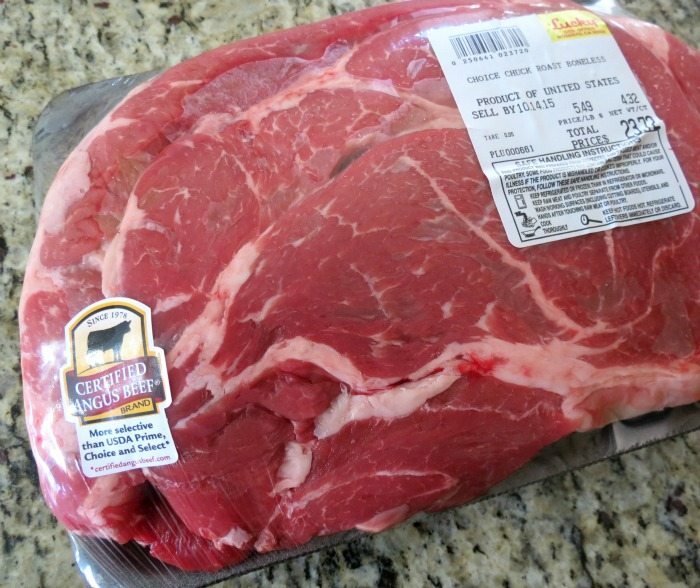 The cooking time depends on the size of the Certified Angus Beef® brand Chuck Roast you choose. You know it is done when the meat easily falls apart with a fork. That’s why I love this recipe. You really can’t make it wrong. This recipe was a huge hit with my Husband. He thought it was a special occasion that he forgot about. How often do I cook a Beef Roast? lol Nope, just a Fall Sunday and I felt the need to warm the house with the aromas of a home cooked meal. I have to admit the smell of the Beef Pot Roast was amazing. I couldn’t wait for dinner to be done. I guess that’s the hardest part of cooking is the anticipation of when it is going to be done. A tender juicy, fall apart, slow cooked beef, served with celery, carrots and onions. In a large Dutch Oven; add olive oil and place on medium heat on stove top; let warm for 30 seconds. Add onions and cook for 1 minute. Take onions out of the pan and add carrots and celery. Cook until lightly browned; about 3 minutes. Take the vegetables out of the pot. Sprinkle salt and pepper to the beef and add to the pot and sear all of the sides until browned. About 1 minute per side. Turn the heat off and remove the meat out of the pot and add the vegetables back to the pot. Place the Beef on top of the vegetables and rub the top with garlic. Add rosemary and bay leaves to the top of the roast. Add 2 cups of beef broth and cover. Place in the oven and cook for 3-4 hours. The roast is ready when the meat falls apart. You need to check out the Certified Angus Beef Roast Perfect Pinterest Board with lots of gorgeous photos and recipes. You can go here. I hope you have a fabulous Sunday and I hope you think of making your own Certified Angus Beef® brand recipe this holiday season. I’m skipping the turkey this year and making another roast! This post is sponsored by Certified Angus Beef in conjunction with a social media campaign through Sunday Supper LLC. All opinions are my own. What temp should the oven be? You say 2745 F? Opps, I have to fix that. It’s 275. Thank you for telling me. This looks SO good for the holidays to impress guests, or just because. So comforting! Thank you so much Nichole. Grumpy’s familly is all about the pot roast 🙂 Looks delicious! Ha ha! It’s a pretty big tradition in my family too. 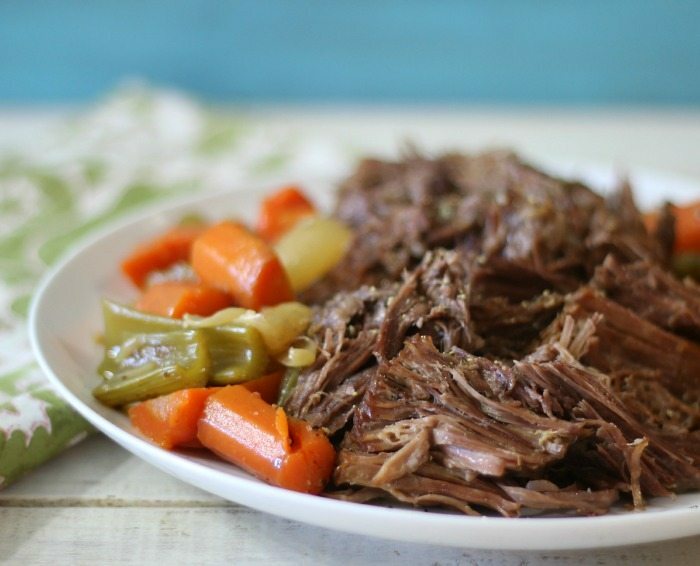 Beef Pot Roast is one of my favorite comfort meals! It’s one of mine too. 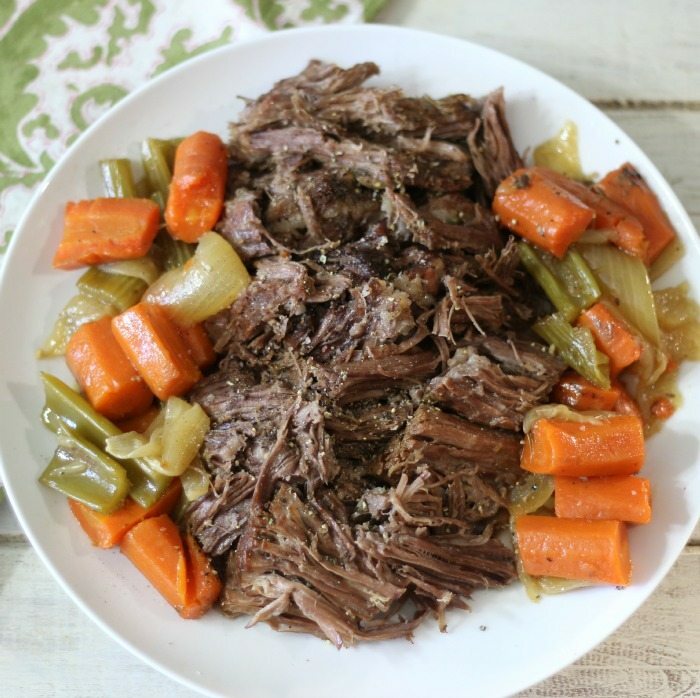 I lovvvve a good fall-apart pot roast! I love pot roast its pure comfort food! Thank you Cindy! Me too! 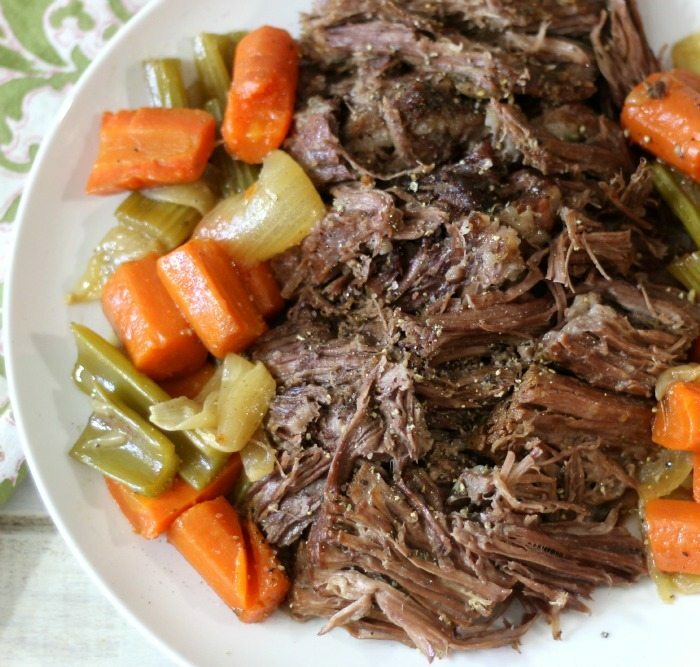 Your pot roast turned out so good, it looks so tender and mouth watering! Definitely a platter of comfort. Looks so good! And you’re so right about the carrots…so good when they’re braised in that beefy broth! What a wonderful pot roast! 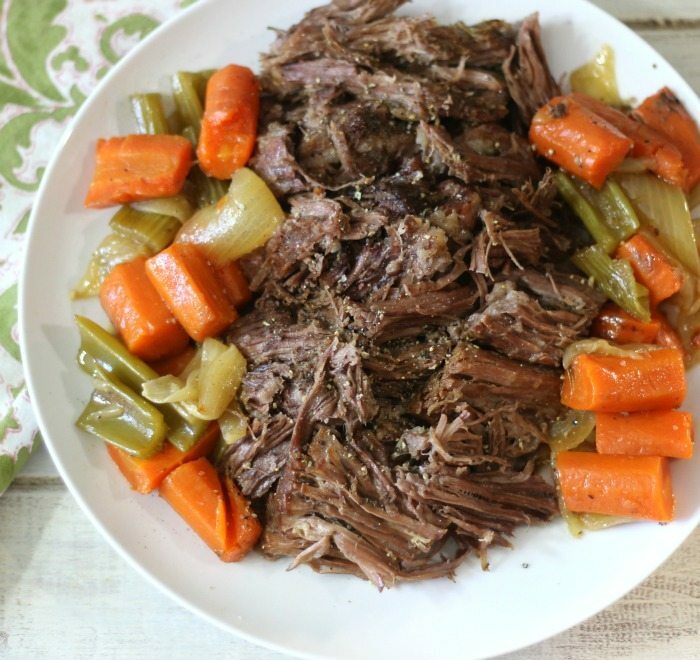 We do love a good pot roast and this looks absolutely perfect, Jennifer! Brings back memories of my childhood #SundaySuppers! This roast looks like the perfect winter comfort food! This is just the kind of meal I like to have on a chilly evening.